Khin Zarchi Latt (Nora) is a Multimedia artist from Myanmar. She is known as a visual artists, but is also as a filmmaker. Working primarily with photography, video and performance art, she participated in international exhibitions in France, United Kingdom, Japan, India, Malaysia and Singapore. She also participated in more then (20) group shows in Myanmar. Her artistic practice is about exploring the relationship between society, politic and ideology of life: a reflection on how they are dealing with all that. 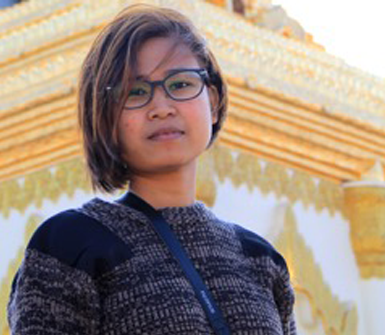 “I was born 6 December 1988 in Dawei, Tanintharyi Peninsula but is now based in Yangon. I studied Computing Science when she was in University. Although I was attracted for creating arts, I spend all of my early 20s working at Service Industry. In 2014 I had a chance to study the Arts and Social Sciences Intensive College Program at Theik Khar Myanmar Institute emphasizing on subjects as as Photography and Documentary Film Making. I was also able to involved in many artistic activities not only at school but also significant event like Image of Women (IMO) . There, I absorbed the splendor of photography and documentary filming. Besides, she also joined some photography and documentary workshops. I organized a basic photography workshop with thirty street children at “Golden Lion” Monastery in Shwebo and another workshop for the children of leprosy patients in Ma Yan Chaung Community. In October 2014 I got opportunity to attend Rainbow Reel Workshop and I directed my first short Documentary “Open” . I love to discover the deliberation concerning human behavior and society while traveling esp. hiking. I am passionately interested in crafting art with community, documenting reality in an instant, using light and time to reproduce a moment, as it is perceived. Now, I’m teaching the subjects (Power of Photography and Social Change thru films) at Thiek Khar Myanmar Institute”. Why did you want to tell the story OPEN? “Ko Latt is on of my sister’s artist friends as they are on the same trend of creating arts. I came to know him while I use to visit to their art space and their performance shows as well as exhibitions. We knew ko latt as straight and become friend as straight. However, He proudly admits he is gay when he came back from studying at Switzerland. That fact opens our eye to wide more about LGBT and I respectfully notice his arts become more powerful and deep more than before he did. There is one point interest me from his story when he explained to me, that is we, human beings are very much important to live just the way you are. If you are not live that way may be because of social pressure or family pressure, you can not fully happy or you cannot fully live, express your live which is very short. You are like living in jail. So what the point living? Living is only meaningful when you can live freely, no-worry of being who you are, value and proud for that. They are the qualities that we couldn’t buy with money , any material that we have . Therefore I proudly decided to make this documentary to bring this message”. Can you tell something about the collaboration with Document Our History Now? “I’m so honor and glad my documentary in Document our history now as I believe art is powerful weapon to bring social change”.